This Reference Article defines and explains how the EPLS software synchronizes data from the Central Database to the Local Database. When the process is triggered, EPLS checks the Last_Sync_Date field in the Configurations table and compares that value to the Modification_Date field in each record of each table critical to EPLS operation (e.g. Items, Material_Group_Codes, Plant_Lines, Plants, Production_Lines, Users, User_Roles, etc.). Any record in the Central Database in one of those key tables with a Modification_Date field greater (i.e. newer) than the Last_Sync_Date will cause EPLS to copy that record and update the same record of the same name in the same table in the Local Database. 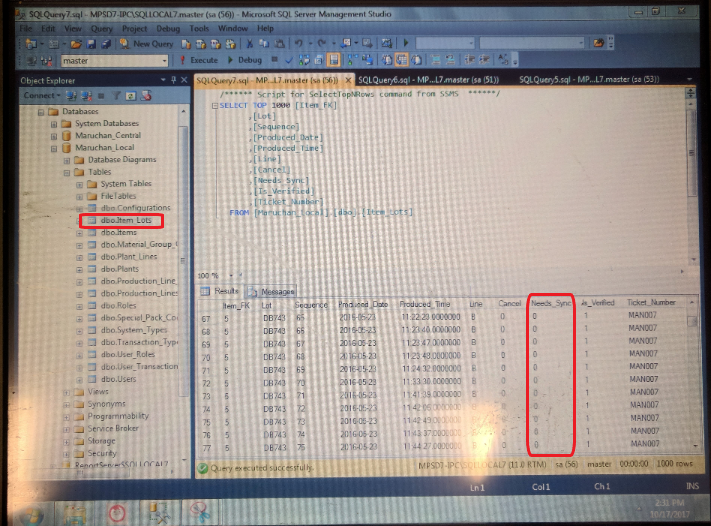 After the tables are synchronized, EPLS then looks in the Local Database Item_Lots table for any records with a Needs_Sync field that contains a value of “1”. Each of these are then copied form the IPC Local Database to the Server Central Database. Once copied, the Needs_Sync value is set to “0”. Note: If EPLS has the wrong password for the Central Database, it will yield a false positive for synchronization (it will indicate ‘Synchronization Success’ when, in fact, it failed).